Is it just me or are they WAY below par in the wet?? I was coming back from Pauanui on Sunday and my god they were awful!! they just slid on turn in with no grip at all and the DSC was going constantly, this was driving very moderatly aswel! I know they are cheap and nasty, but for the mileage i do and the way i drive it, Its hard to justify expensive tyres especially as the car could be changed tomorrow! The Michelins that i took off with 1mm left were better in the wet! Any body else with this opinion or am I expecting too much from cheap rubbish?? You can have all the electronic saftey systems in the world, but with the tyres being the only thing between the car and the real world, if they are sh*t, physics wins. Id be surprised if you get any better or even the same milage out of them. to be fair you are not really comparing apples with apples. We sell hundreds of the Altenzo tyres and we have not had any complaints. However , we do make sure people know that they are a touring tyre rather than a performance tyre like the Michelins, Conti's etc. If price is an issue for you then the Altenzo are probably the pick of the bunch. Was it absolutley bucketing down or was it light rain? What pressure are you running in them? I understand that, i run Pirelli Pzero's on my own car. It wasnt bucketing down just light rain. I took them off this morning and replaced them with Pirelli Pzero Runflats, Problem sorted. the short answer is you get what you pay for, and my experience is similar to Aidans; cheap tyres generally do not perform well. It is easy to dismiss it and say well they are a budget tyre and people should drive accordingly . It sounds like Aidan was but his experience was enough to have him heading for some really good tyres. As Andy says its the tyres that stick you to road not the ABS - driving on rubbish tyres is like speeding without your seatbelt on - you could equally dismiss this and say " it only hurts when you go through the windscreen". I have been to more than 450 serious car accidents and tyres with one or more of the above shortcomings have featured in the majority of them. Driving on the wrong side of the road (really dumb) features along with tyres, The two seem to go together for some reason? I have put the Altenzo on my 330 motor sport that has a lot of suspension mods, and the only problem with them is a small vibration at speed when they are cold. Grip wise they are fine for a road car, even in the slush and snow, and as we are only supposed to be diong 100km/h I would have to put it on the track to compare them with what I had before & I have a race car for that, hence why I gave the Altenzo a go. Previous Tyers were : Eagle F1, excelent but lasted 5 minutes and got very loud as the tread got down, and when I got the car it had Michelin Pilot Proceda, useliss in the wet and cost more than the car was worth. David, one factor against the Michelins, may be their age? i.e past their use by date- could you comment. 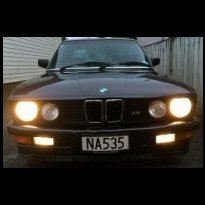 My 328 had the original Contis on it, they were a bit noisy in the dry but were lethal in the wet, they were 6 years old at the time. one thing i noticed working in the wreckers is that not many of the cars coming in damaged have 4 good tyres on them. most seam to have very bald tyres , or a mix of good and bad , brands or levels of tread etc. so it pays to have good tyres. I had them at taupo on the back just because i wanted to use the things up and the back was loose as, though admittedly they arent designed for that use..
kingstars are the devil...see soooo many Evo's and STi's and stuff on them and all I can think of is "you've never actually driven that car the way it's ment to be because, if you had, you wouldnt have that sh*t on there"
Went and seriously looked at a M3 on a yard once...they'd put a new set of Kingstars on all round..tried to say 4 brand new tyres etc real good ya wont need to buy any for awhile blah blah...promptly told them i'd want the cost of a new set of tyres taken off the final deal! My e36 318 coupe came with kingstars which had fine tread but were ALL age damaged with serious cracks and finitely localised perish bulges on 2 of them. Went and got 4 new pirellis quick smart (and became very very poor). You get what you pay for in tyres. In my daily, recently switched from Bridgestone AR10 to Maxxis some random model. Half the price, half the grip, half the confidence they gave me. I have to go round corners 25% less speed in the wet or they slide big time. That's when they are new with full tread, I can imagine it turns into custard at half tread. If you run winter tyres you must run 4 ( all though I do not understand why they are even legal here). Tyres on the same axle must have the same load rating (+/- 2) and they must have the same speed rating. In addition to this vehicles post 2005 must have the same type of tread pattern (asymmetric, directional etc) on all corners. However, the number of cars we see come through with new warrants that are in contradiction to those regulations is unbelievable . Just in the last week we have had people come in here where one tyre has been failed but the other tyre on the matching axle is actually worse. We have even had a BALD tyre pass compliance but it failed on a string repair. You have to blame the WOF guys for this, and assume they are either uneducated,being pushed to make monetary targets or just plain useless.? What is really needed is a complete overhaul and an education programme, but we seem to have this fixation on speed and don't actuallly look at what causes the crashes. People should buy the best tyre they can afford. In some cases they cannot afford a Pirelli or Conti unfortunately. BUT- you cannot then extrapolate this and say its all the fault of the WOF inspectors. It is a broad picture and everyone should play their part I once went to my tyre guy of choice and said "can you get brand XYZ?" he said yes and I asked if he would then get me a set of these for my then Toyota Corolla. His response - NO I wont sell them they are rubbish. So I bought a better quality tyre. The Industry could set some standards , ban imported used tyres would be a good start , then follow it with the kingstars, linglongs and other nasties. Government could ban snow tyres except during winter in mountain areas where they are intended to be used . They could also use one of the international standards as a minimum standard for new tyres but that would lose them votes so they wont. I would say a good 40-50% of cars out there are running substandard rubber. Im talking basic stuff here, not what is the best performance tyre. #2 Acceptible tread limits for the _weight_ of your vehicle. And the rest you both have listed. My wife has the mentality that the tread is fine and it passes a warrent so it must be fine. The same can be said for shocks, bushes, rotor and pad wear and brake bias! :| all factors in a lot of accidents that just dont get looked at yet cause a lot of evasive action acceidents. You could back that one up even further and include driver education. having some idea of what they are supposed to be doing would be great start. - braking through corners even UP HILL?? - doing 3 point turns on a blind corner on an open road?? If they had some concept of what was involved , they may choose better tyres and suspension and cars in which to do it? To quote a good friend:"we all have the right to be or act stupid on ocassion , but some abuse the priviledge"
Unfortunately when in comes to the motoring public the statistics clearly show too many are abusing this priviledge. I think you may have misinterpreted me - I am not saying it is all the fault of WOF inspectors. I am saying that is where a good part of the problem starts, especially when you see first hand tyres passing a WOF that really have no right to. Too many of the general public think because a tyre passes a WOF or Compliance then it is safe. Unfortunately this is not the case. I agree re banning used imported tyres, there is some unbelievably bad stuff out there. New imported tyres will never be banned. All tyres are now imported so how do you distinguish one brand from another? Some Dunlop are made in Indonesia, some Goodyear are made in China, even some Bridgestone nowadays. It is all well and good saying "but 'name brand' have their own factories in China. I have just been over there and there are a lot of newer tyre factories which are not a "name brand" that use machines that are actually newer than some of the name brand factories. I actually spent a couple of hours in Hong Kong airport talking to a German man who does the maintenance on his machines in China. It was a very interesting chat and he was of the opinion that the Chinese have learnt very quickly how to make a reasonable tyre. Having imported Chinese tyres for the past 8 years, I have seen a huge leap forward in technology from where they were to now. I am not saying they are up to Pirelli standard for example, but they are not as bad as they used to be. Sure there are still some dodgy brands out there and unfortunately some unscrupulous people that import them just to make a buck. Education is the answer and as I mentioned previously, until we get rid of this fixation that "speed kills" we are never going to move forward. Yeah... and that's just the Police cars around here - The general public are even worse. Nearly hit twice last week (they were both SUV's funnily enough!) and had to take evasive action - one was heavy brakes so I didn't T-bone one doing a U turn and one mounting a round a bout to miss someone who was stopped, but pulls out as I was in front of them. I encounter someone over the centre line on my twisty drive home EVERY day, and honk at EVERY one of them. How can it start with the Wof inspectors, they are the ambulance near the bottom of the cliff ( Fire & ambos are right at the bottom). In theory this is where the problem should finish i.e they should be confirming that joe public's car is safe. How many cars have you seen turn up that clearly should / could not pass a warrant and then watch Joe P try and argue why 3 bald tyres , knackered suspension etc is fine because he has been driving like that since the last warrant 3 years ago , which wasn't re validated because the tyres were bald back then -- get my drift ? The legislation the Wof stations have to work to is also quite crappy , particularly with regard to tyres WOf station are the inspection agency only what about the police enforcing the rules random checks when were you last stopped ? I didn't make any comment about banning new import tyres - I made a comment about them meeting international standards, some of them mght even have the markings but arguably would not pass the real test. Making tyres is no different from any other industry , you can have the best machinery but if you put rubbish ingredients in and have rubbish design and standards you will still get rubbish products like Kingstar out. the tyre shops like tonys and all that should be the people that are educating. how can a car with different tread and type on all four corners be safe? he does sh*t loads of milage and easily goes through a set of tyres or two between WOFs. Grip is one A with AA being highest. On paper they have more traction than the majority of Firestone tyres that NZ'ers love to put on there cars so they can't be that bad. My own pref for road tyres is for AAA with 180-220 treadwear with bridgestone being the tyre of choice for the last 4 sets based on price / performance.